Let’s say we start with a sentence like this, “The kitten climbed up the tree." To respond we could say, “We want the kitten to not be up in the tree." However, it would be stated more clearly if we said, “We want the kitten to come down from the tree." 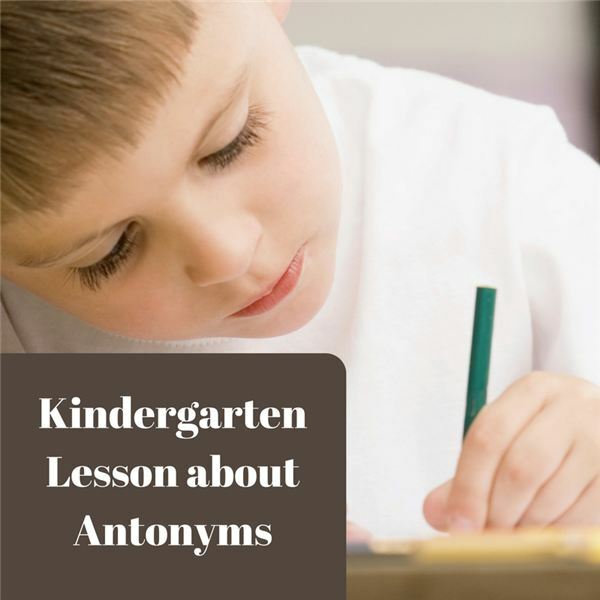 This lesson focuses on antonyms by listening to a book and doing an art activity. When completed the work can be used throughout the year. Prepare to read one of the books that you have chosen. Say to the children, “Today we are going to talk about antonyms or opposites. Does anyone know the opposite for up?" Continue with a few other easy ones: happy, open and tall. Then say, “I want you to pay close attention to the illustrations in the book because afterwards we will be drawing our own pictures." Pair up the students and give each pair a piece of paper that you have prepared. You may need to read the words to some of your students. Then partners need to talk about what they could draw before they get started. An example for big and small could be drawing a big house and a small house or a big dog and a small dog. Cut the papers on the fold and allow partners to stand in front of the group to share their pictures with the class. Use 6 to 8 pairs of antonym pictures to play a memory game with a small or large group. Turn pictures face down and take turns turning pictures over trying to match the antonyms. Place pictures face up on the floor and time groups to see how fast they can match the antonyms. Jeffers, Oliver. The Hueys in What’s the Opposite? Philomel Books, 2016. Hatanaka, Kellen. Drive: A Look at Roadside Opposites. Groundwood Books, 2015. Hoban, Tana. Exactly the Opposite. Greenwillow Books, 1990. Seuss, Dr. The Foot Book. Random House, 1968.